At "Crater View", one of the most spectacular vistas in the whole world. 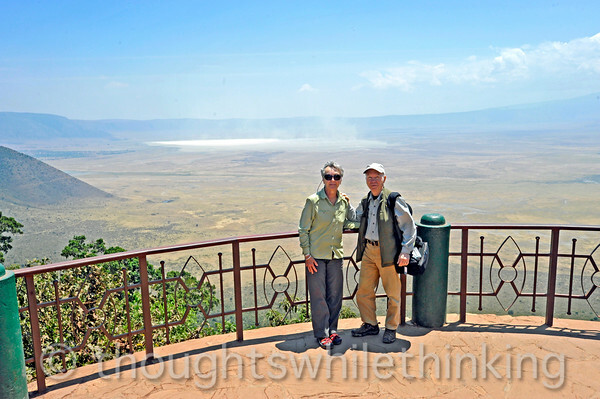 With a diameter of about twelve and a half miles, the crater is the world's largest unflooded caldera, created two million years ago when an enormous volcano exploded and then collapsed. Containing a soda lake (that white spot in the distance), forests, streams, most of the mammals of East Africa except for giraffe, which can not traverse the steep crater walls, this is one of the best game-viewing locations anywhere. Of course, being world-famous, lots of other travelers are also to be found in the crater, as you will see later. So we selected a camp that is inside the NE gate and part way down the descent road. This affords, with an early morning departure, an hour or so head start on the others who are staying at lodges and camps further up on the rim.